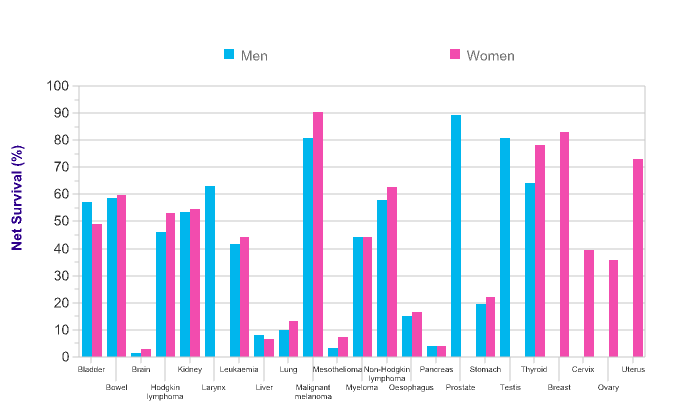 Five-year net survival is highest in the youngest adults for nearly all cancers, with survival generally decreasing with increasing age. Five-year net survival is lowest in 80-99 year-olds for all cancers, and this takes into account higher mortality from other causes in older people. 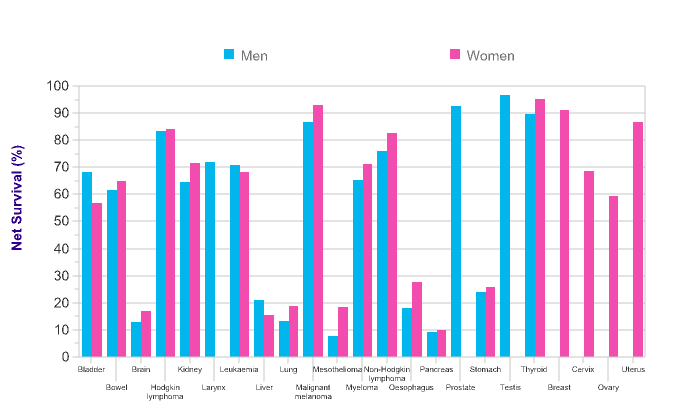 The typical age gradient is probably due to differences by age in the disease itself (e.g. 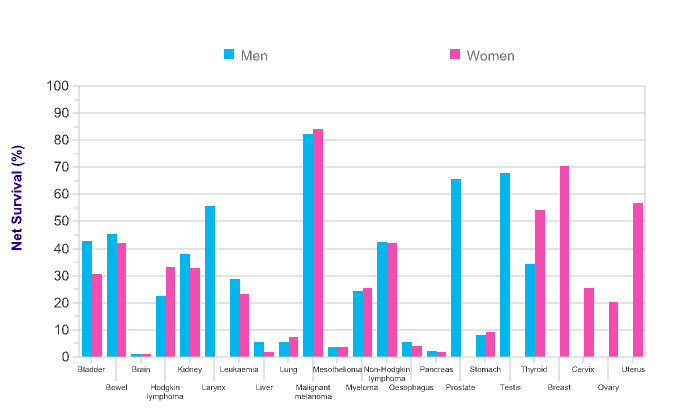 the proportion of more treatable tumours), and treatment for it (e.g. availability of and ability to tolerate the most effective treatments). 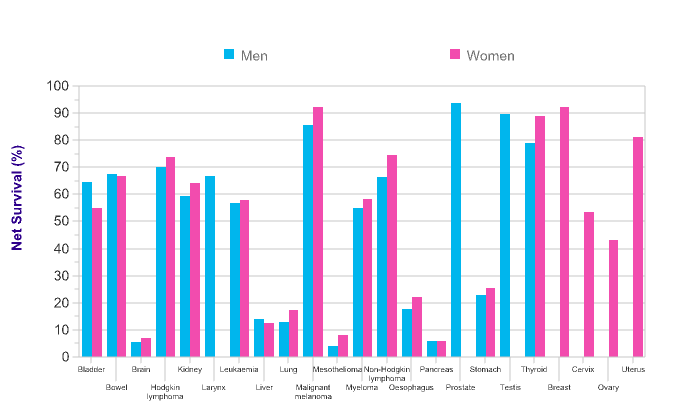 The notable exceptions to the typical age gradient are breast and prostate cancers, where five-year survival is highest in middle age, and bowel cancer, where five-year survival is similar between young and middle-aged adults. 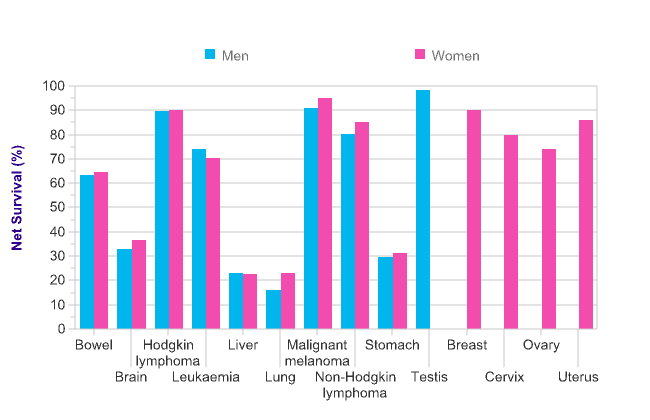 For these cancer types, survival is higher in the age groups targeted for screening (breast and bowel) or early diagnostic practices (prostate specific antigen [PSA] testing). Five-year survival is predicted using an excess hazard statistical model. Office for National Statistics. 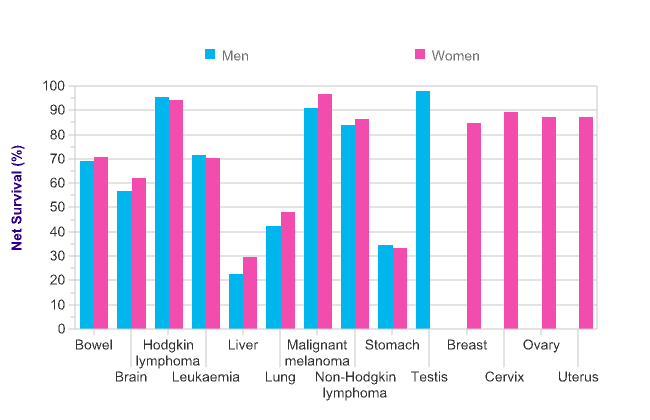 Statistical Bulletin: Cancer survival in England: Patients diagnosed 2007-2011 and followed up to 2012. Newport: ONS; 2013. Data is for: England, 2009-2013. See source for ICD codes and other data specifics.